Since today is Friday the 13th I thought I'd take this opportunity to post a photo of my cat. Two years ago this stray cat started visiting my garden and I began to feed him. As everyone knows once you feed a stray animal it basically becomes yours and you can expect it to stay around. To be honest I didn't start to feed him out of the goodness of my heart. My reason for feeding him were because I thought a black cat would look cool in a garden with black flowers. In exchange for food he keeps the garden free of squirrels and rats and will help me plant bulbs/seeds by pawing at the dirt when I'm digging. I look the other way when he catches a bird or butterfly and forgive him when I'm startled to find him laying below some plants. What's an urban garden without an urban cat? We somehow keep getting strays dropped into our laps. We now have 2 cats, however I do not let them outdoors becuase they eat the lizards. The lizards are helpful in our garden and we have hundreds. He's lovely. We have, let me see...Messrs and Ms. Grey Thumbs (four grey cats, e male and 1 female) Mr. Black Thumbs (1 black one) Mr. Orange thumbs (orange marm) and Mr. orange and white many-thumbs (polydactyl orange and white badcat). Yup, that's eight. Mostly rescues. Good on you for feeding this lad. He's lovely. 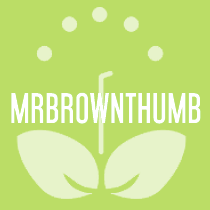 very classy, mr brown thumb! most folks buy their garden accessories rather than luring them... or is this an italian trend? "I thought a black cat would look cool in a garden with black flowers." !!! I love your honesty, and you know? He's quite handsome! He has the look of an "urban cat" like he has been around the block a time or two. I had a black cat for 16 years, Tommy Tom was his name, I still miss him. Hey Peter I tried to comment on your site but your template is buggy in FireFox and when I click on comments nothing comes up expect for the word "ok" and some blank white space. 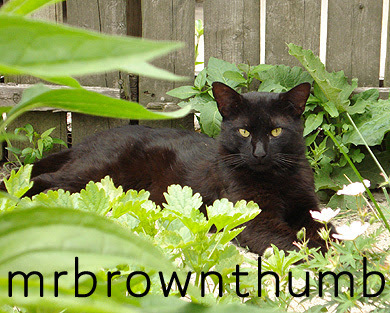 Funny to hear someone else has a cat named Mr Black Thumb. LOL. BS, Thanks for the link that's pretty cool. Mr Black Thumb wants to thank Carol and Sassy for the compliments. You know this is the first cat I've gotten close to since my childhood cat passed away when I was in college. While MrBlkT has some endearing qualities like walking with me to the corner store and waiting outside to walk back home I still can't get over the loss of my childhood cat. He liked to help me draw and color...I always end up with helper cats it seems. Thanks for stopping by all. Mr. Black Thumb is a lovely garden accessory ... and stray cats grow on you until you can't imagine a time when they weren't part of your family. I had two black cats, Otto and Willy, who looks eerily similar to Mr. BT. Even without black flowers he looks quite stunning against the foliage. 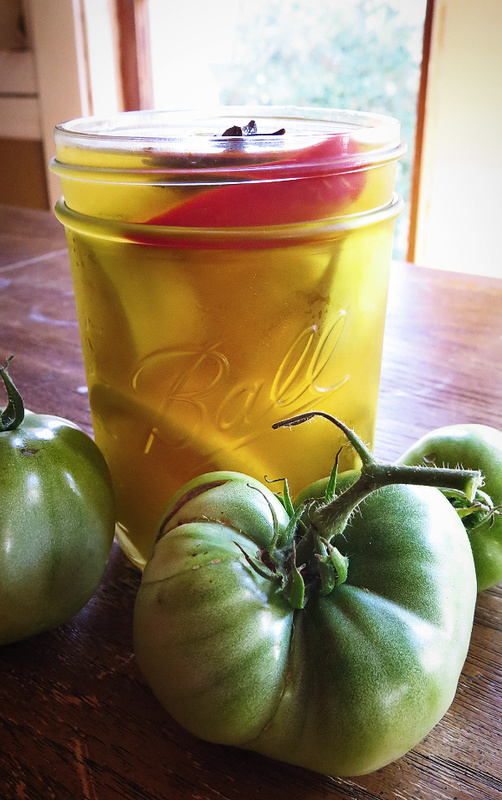 Hey, you've had your blog as long as I've had mine! Mr Black Thumb is very handsome. It's hard to photograph black cats so their features are clear, and that's a great photo! I love the cat pic...do you still have him? There is a Siamese that makes my garden a stop on his daily route...I don't mind cause he frightens the bunnies. I'd like to get a pic of him someday. Garden Mom, He still comes around from time to time and visits. Not much but every once in a while I'll spot him. He's had some kids that I see in the neighborhood. They grow up and forget about you.